The entire family has decamped to Aunt Mimi’s house in Paris and we are living in organised chaos with Mama as usual in charge of exactly what we are doing each day. Even Sir Oliver, Mimi’s new husband has acquiesced to her will for a quiet life. Paris in June is blissful and offers racing to the turf enthusiast nearly every day. Usually there is wonderful weather and relaxing outdoor fun. We have missed the Prix de Diane at Chantilly on the 7th June and the Prix du Jockey Club at Chantilly on 14th June but we are here today for a family outing at Auteuil for the Grand Steeple. Auteuil is set deep within the Bois de Bologne on the western fringe of the city and it does feel as if we are in the country. We loiter in the pesage or paddock, the exclusive enclosure with the viewing stands. And alternate watching the races with strolls behind the stands over the luxurious green lawns with decorative flower beds, popping into a cafe where necessary. Here the fashion parade unfolds with beautiful women showing off all the latest couture. “There is an air of restful refinement about the races in France, in contrast to the noisy race-tracks of England and the United States.” Says Aunt Mimi as we take an early lunch. “Yes, there is also an absence of the “horsy” type so prevalent at Sandown Park or Epsom Downs.” Adds Sir Oliver with a smile. During the summer the races have become an institution with practically every American in Paris attending. Papa remind us that racing in France owes much of its prosperity to American sportsman. Through tangles of undergrowth run driveways and equestrian paths and scattered within its leafy interior are not just several race tracks but a dozen or so restaurants and cafes that become the centre of the Parisian social scene and nightlife in the summer.This time – 5pm – is the fashionable hour for the Bois and every inch of the avenue is taken up with luxurious automobiles and elegant strollers. We stop at the small, confined but terribly Parisian Cafe d’Armenonville on the Paris side of the Bois near the Porte Maillot which is the smartest place for tea and fashionable for luncheon too. It is owned by the Mouriers, who also own the Café de Paris, Fouquet’s bar and the Pre-Catalan.Parisians love the ‘intimite’ of d’Armenonville and marvel at the agility of the waiters as they slip between the tables so discreetly. The place is awash with the rich and famous and well-to-do folk like us. There is the princess who has eleven dogs of various hues to match each gown she wears. On our left is an actress who wears a coat made from the skin of her pet baboon and there is also a famous demi-mondaine who is brunette in the daytime and blonde at night. Each of the Bois venues has its special gala night where tout Paris is to be seen. It is important to be at each place on each successive night. 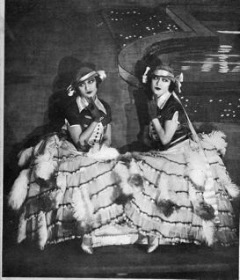 Famous dancers or the latest cabaret favourite usually supply the entertainment. We rush back to Paris, change and freshen up for a quick cocktail before darting back into the Bois to the l’Hermitage on the far fringe of the Bois on the banks of the Seine near the Longchamps race-course and the Porte de Suresnes. L’Ermitage has a paradoxical rusticity and gives a pleasant sense of escape from the city with the Siene lapping lazily by along the edges of the terraces and the green stretches of Longchamps not far way. The gardens here are immense and create the illusion of being completely in the country. It is quite lovely sitting outside having dinner and drinks in the gardens where the warm nights make it a delight to linger under the trees in the soft glow of admirably planned lighting. The entertainment tonight is superb with the fabulous singing and antics of the Trix Sisters and the dancing of Charlie Stuart, Barry Bernard and Joan Pickering, who are all doubling up at the Club Daunou later in the evening. On our return to Paris we stop off very late at the salubrious Pavillon Dauphine for champagne and a little more dancing. Situated at the bottom of Avenue de L’Imperatrice, and just inside the confines of the Bois within its own luxurious gardens, this stately building was erected on the site of a Chinese Pavilion in 1913 by the city of Paris. One gets an amazing view from here of the Avenue as it rises toward the Arc de Triomphe. Its initial purpose was to serve as a place to receive official delegations arriving by train at the Porte Dauphine station before being taken to State buidlings such as the Elysee. It is now a famous summer rendezvous for drinks, dinner and this season they have a superb cabaret headed by the wonderfully eccentric American dancer Nina Payne, straight from her performance at the Folies Bergere and the Dorel Sisters. However, I am told that for some it is too close to Paris! Tonight we are off again to another gala in the Bois this time at the Pre-Catalan. Cecile is joining us. As usual all the ladies are gowned beautifully with Cecile and Millie in creations by Paul Caret and Mama and Mimi in Lucile concoctions. The Pre-Catalan used to be a dairy farm and now has a charm all of its own with its gardens and flowers and lights in the trees. It is situated in the middle of the Bois in its own grounds of several acres not far from Autueil and the Lac Inferieur. The restaurant is a handsome domed hall with an excellent dance floor and we alternate between the restaurant and the gardens until the cabaret begins with Moss and Fontana. They have been dancing in Paris for a while and once again perform their amazing repertoire with astounding dexterity. We leave in two cars and on the way back to Paris, Millie and Henri and Cecile and I drop into the Clover Club in the Rue Caumartin to see the dancing of Dina Harris and Ted Trevor before making our way to the Jardin de Ma Soeur or the Embassy not far at no.17 Rue Caumartin. Here there is a so-called ‘Plantation night’ with Maurice and Leonara Hughes and Harry Pilcer. We have a delightful end to our evening and once again Leonara insists on dancing with me. She is quite lovely. Tonight is a gala night at the favourite society place of the Chateau de Madrid in Neuilly on the edge of the Bois and we are all there. It is a scene is of fairylike enchantment. We take dinner and dance in a large garden under the trees with fairy lights and the beautiful architectural background of the chateau. It is like a private garden party, with the soft strains of a perfect orchestra, the glistening of hundreds of immaculate shirt fronts and the flashing of jewels in the subdued lighting. We observe many well known personalities including Grand Duke Boris who keeps a suite overlooking the garden, the ex-film star Pearl White and various other well known actresses plus a sprinkling of society. However, despite the presence of many celebrities we deduce that the audience is composed one third Ritz, one third tourist and one third business. “Have you noticed” says Aunt Mimi “that the Bois is becoming a little passé due to the vulgarisation of the automobile making it far too aceessible. It used to be just all Ritz types here.” We all laugh. We are back at Auteuil for further racing and spend the evening in and around Montmartre ending up at the Blue Room of the Abbaye de Theleme and once again marvel at the dancing of Fay Harcourt and Harry Cahill and others in a new show called The Midnight Blue Cabaret. I am sure that Fay’s exquisite costumes are created by Dolly Tree. Today is the Grand Prix at Longchamps and the Bois is swamped. It is a glorious day followed by another visit to the Hermitage de Longchamps to watch the assorted pleasures of Carl Hyson and his company that includes Peggy and Betty Harris. Our conversation returns to observations of the Bois and its night-time inhabitants and we discuss the rather rigid set gala nights that each venue in the Bois stages in rotation.